A good base layer is crucial for staying warm during the approaching months of cold, especially if you spend a lot of time outdoors. 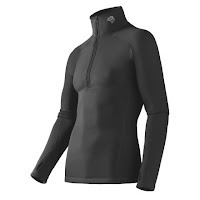 In my gear locker, nearly every base layer I own is made from Polartec Power Stretch. In my opinion, it is hands-down the best fabric out there for next-to-skin warmth and comfort. Why? Several reasons. First of all, Power Stretch earns the name from its four-way stretch, which provides form-fitting comfort and a full range of motion. Most other base layers use a polyester fabric that only stretches two ways, which can lead to a looser fit and a consequent loss of warmth. Second, Power Stretch features a soft fleecy inner face that feels great on the skin and a smooth outer face that makes it easy to layer over. This combination also enhances the material’s wicking ability—your sweat is drawn from your body by the many fleecy fibers, then spread out over the smooth surface for more efficient evaporation. Fourth, Power Stretch is extremely durable. I own several garments that have withstood more than a decade of serious wear without issue. For this reason, Power Stretch is a great selection for liner gloves, which take as much abuse as any other item of clothing.